Pawan Kalyan and Mahesh Babu, the two leading stars of Tollywood, are raring to kick-start the shooting of their next projects. While Mahesh will commence his much awaited bilingual with AR Murugadoss in July, Pawan’s film in Dolly’s direction will also flag off in July. Apart from Dolly, Pawan is also committed to team up with his close friend and leading director Trivikram for his next project, which will begin towards the end of this year. 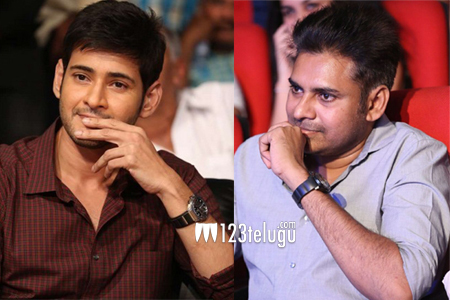 Already, a couple of titles such as Enemy and Chattamtho Poratam did several rounds on social media as the title for Mahesh-Murugadoss’ film. Now, the latest title which has started doing rounds for the Mahesh-Murugadoss’ project is Vasco da Gama. On the other hand, Devude Digivachina is rumored to be the title of Pawan-Trivikram film and Pawan is rumored to be donning the role of god in this project. This is merely a speculation and we will have to wait for the official announcement of the actual titles.